Nintendo president Satoru Iwata has reaffirmed his staunch unwillingness to offer the company's most popular games on smartphone or tablet devices. The gaming giant has continually resisted the clamour from fans (and even shareholders) for classic franchises like Mario and Zelda to arrive on iOS and Android platforms, despite the ongoing slump in console sales and ensuing financial losses. 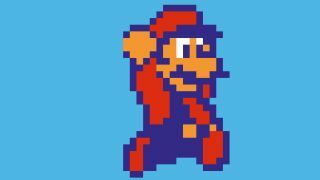 However, Iwata said launching Super Mario Bros. and co. for the iPhone or iPad would only be a short-term money-spinner for Nintendo, while abstaining could ensure the company is still standing in 20 years. He told the Wall Street Journal: "If I was only concerned about managing Nintendo for this year and next year - and not about what the company would be like in 10 or 20 years - then I'd probably say that my point of view is nonsense. "But if we think 20 years down the line, we may look back at the decision not to supply Nintendo games to smartphones and think that is the reason why the company is still here." Instead the company will continue ploughing on with its attempts to engage gamers with its own handheld gaming device, the Nintendo 3DS and, of course, the struggling Nintendo Wii U console. Both devices can expect an influx of top-level games throughout 2013, but whether they'll be enough to increase the uptake remains to be seen. Nintendo announced Mario Kart 8 and Super Mario 3D World at E3, this week, but developers are hardly clamouring to make games for the consoles. EA, for example, appears to have walked away from the Wii U completely. Do you agree with Iwata's stubborn stance or should Nintendo cash in while the going's good? Let us know in the comments section below.